I wonder if Spielberg, Jackson, Wright, Moffat, Cornish et al have considered the mystery of the ‘Uncanny Valley’ in their latest CGI film, The Adventures of Tintin: The Secret of the Unicorn? I’m talking about the principle that when things appear, or intend to appear as visibly human as possible they often can’t jump the gap in one’s perceptions, thereby freaking the living crikey out of an observer. Take some time to digest the diagram above, and then hit up the video below to see what I mean. My suspicion is that, yeah, they’ve just about played it safe, but the characters in the film will feel less familiar than they did in the comics, or even the cartoon series. 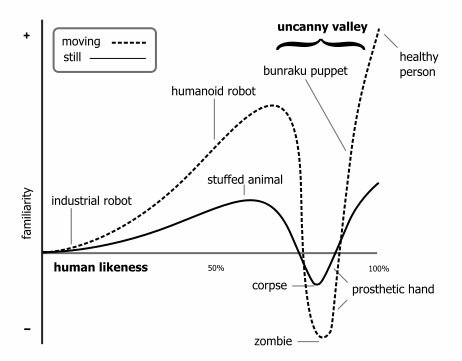 For more on the Uncanny Valley, check out my post on Branded Robotics, where a leading scientist gives me his thoughts on what works and what doesn’t. Hopefully, the Tintin creators have done their research too.